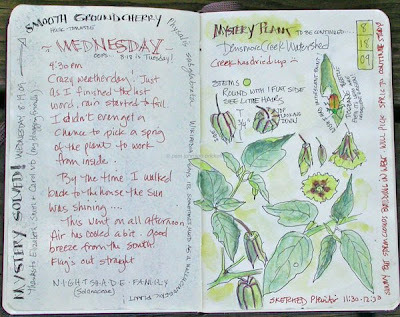 South Carolina LowCountry Nature Journaling and Art: Mystery Plant Solved! Back in mid-August I came upon a wildflower I'd not encountered before. 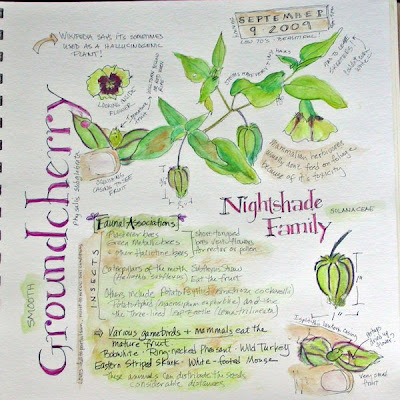 I sketched it in my small Moleskine, and because I had failed to pack my wildflower guides for our NY trip, I asked my blogging friends to help me out with it's I.D. Here's the 'Mystery Solved' completed journal page. I've been wanting to create a larger page to celebrate my new find and finally, yesterday, I managed to escape to the creek. I remembered to bring a towel to sit on (grass stains on white pants last time) and there I sat for an hour, in the late afternoon sun, watercolor pencils laid out in front of me on my tote bag, sketchbook in my lap. This time there were only a few flowers in bloom and most were at the end of the plant's stems. Lantern shaped casings covered most of the plant. They had grown quite a bit since my first sketch and I could feel the small fruit inside. My internet research on Groundcherry provided interesting facts and I wanted to include 'Faunal Associations' on my page. That's where I started and worked the illustrations around this type block. First, I split one of the casings in order to get a good look at the fruit. There was a loose dried up piece of plant in the casing - part of the flower? I was hoping the berry would be larger and I'm assuming they will grow more as this fruit was green. When ripe they can be yellow or red in color and the casing turns brown. I wrote and sketched with a .005 Micron pen that kept wanting to dry up. I had to retrace some letters - not always a fun thing to do. I finished drawing just before 5 p.m. and then was attacked by skeeters! Coloring waited until after dinner. It's funny. A lot of time lapsed between the initial sketch and yesterday's. 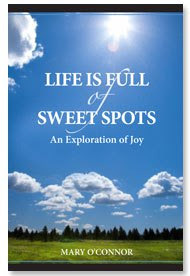 Plenty of time for me to think about page design for my next entry. HA! Working in the field can oft times take you on a different ride. While initially disappointed in my endeavor (crooked type and date block, light ink on words....) today, when I photographed the page, I felt like it was fresh and immediate - just as it should be for field work. Ack!! I was going to suggest that but thought you were probably familiar with it. I think it is part of the family Pysalis, which includes tomatillos. Oddly enough I just checked and tomatillos are Pysalis philadelphica. Who knows why they are 'philadelphica' when they are mainly a Mexican plant? Nonetheless we have them growing in our Philadelphia backyard and use them for salsas. The best thing about them is once planted you never need to plant again because there are always volunteers. I believe that the plants look very similar except that tomatillos stay green throughout most of their life. Lovely page. No squiggly lies but fun squiggly words! I now print out your pages like this one, I am building a "Pam" field guide, ho ho.